This video shows the reconstruction and simulation of poliovirus using the BlueGene/Q supercomputer at the Victorian Life Sciences Computation Initiative. 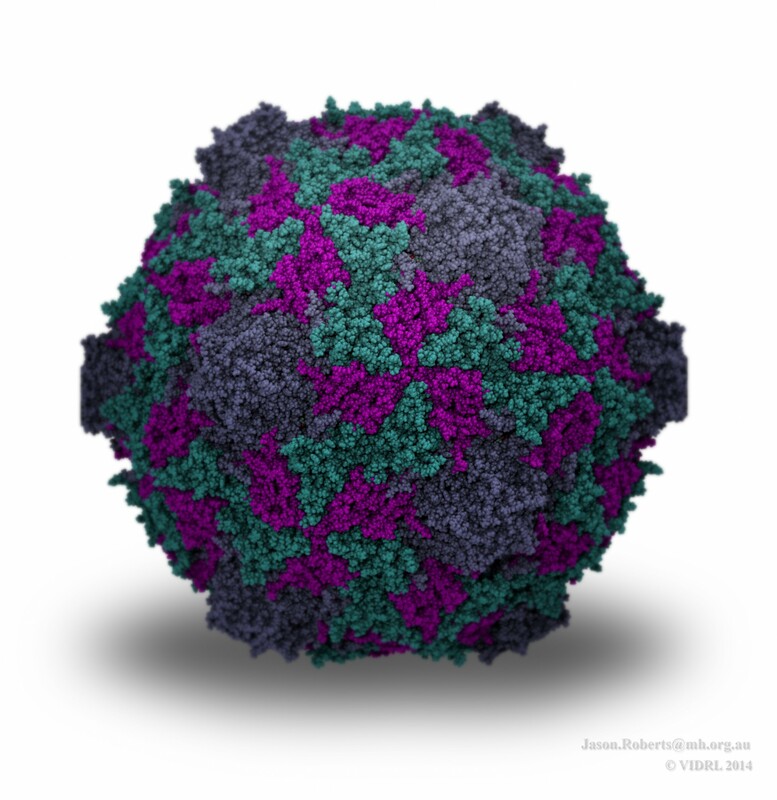 The poliovirus model is being used as a basis for understanding antiviral drugs, virus infection and helps us to learn how to model related viruses such as Enterovirus 71. 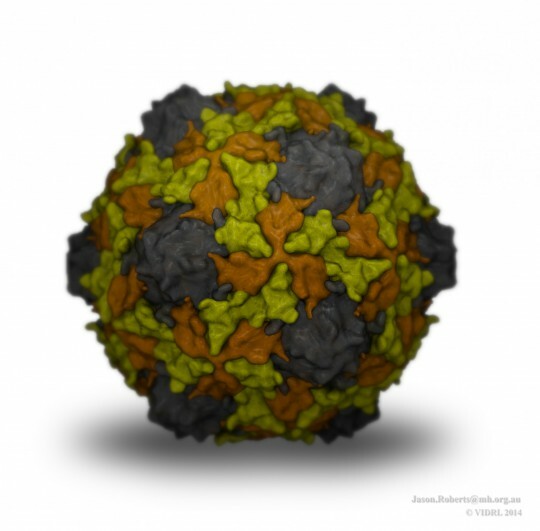 Cutaway representation of a complete poliovirus virion after a 0.1 microsecond simulation. Image shows the genomic RNA in the core with associated Magnesium ions (purple). 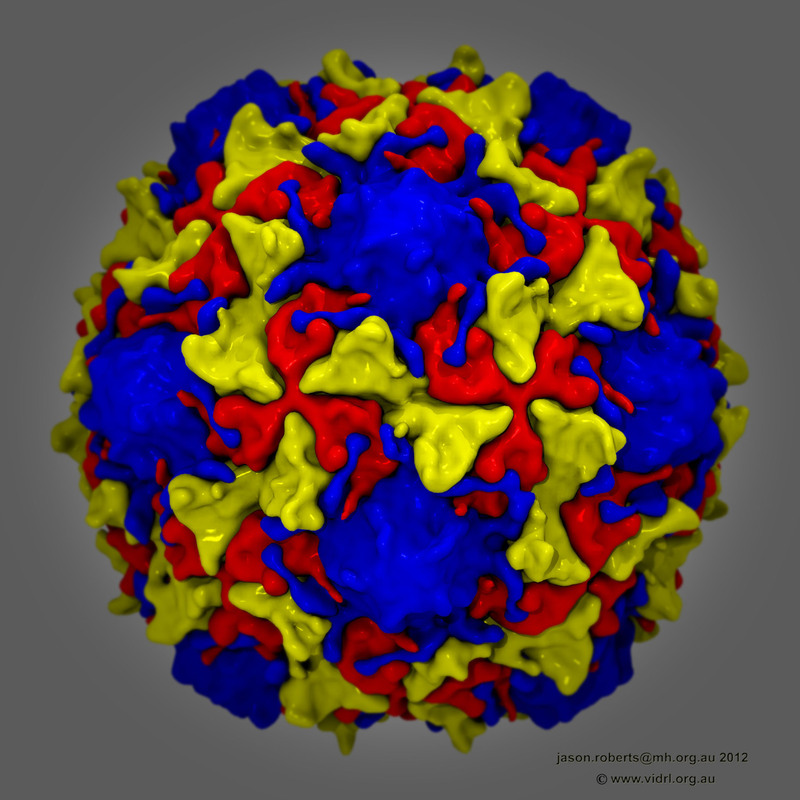 The protein chains that comprise the surrounding capsid are shown as Blue (VP1), Red (VP2), Yellow (VP3) and Green (VP4). 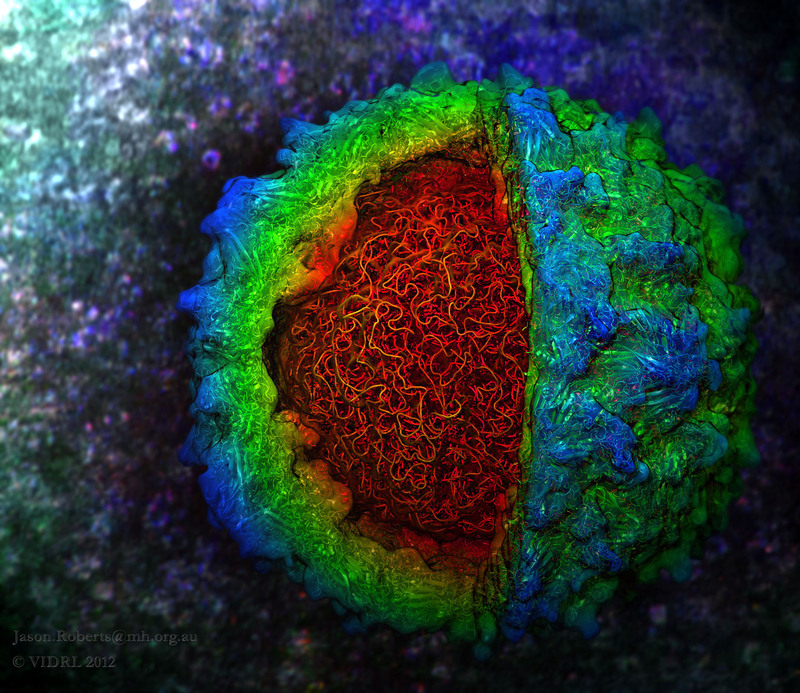 Simulations totalled 3.7 million atoms and were performed using a BlueGene/Q supercomputer at VLSCI, Image created using the Tachyon renderer in VMD. Contact Jason Roberts for further details. 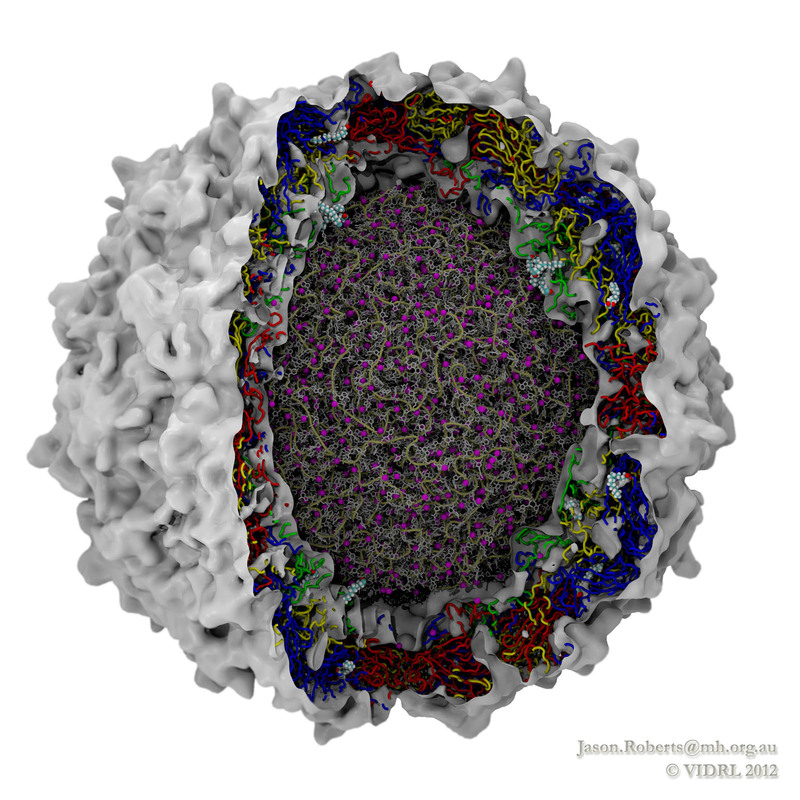 Cutaway representation of a complete poliovirus virion after a 36 nanosecond simulation. Image shows the genomic RNA in the core. Secondary structure is represented in “new cartoon” form, with a transparent surface representation coloured by radial distance from core. Simulations totalled 3.7 million atoms and were performed using a BlueGene/Q supercomputer at VLSCI, Image created using the Tachyon renderer in VMD using a STRIDE representation of secondary structure. Viewpoint of the poliovirus capsid structure showing the interlocking protein chains that comprise the surrounding capsid highlighting the icosahedral symmetry of the virus. Protein chains are shown as Blue (VP1), Yellow (VP2), Red (VP3) and Green (VP4). 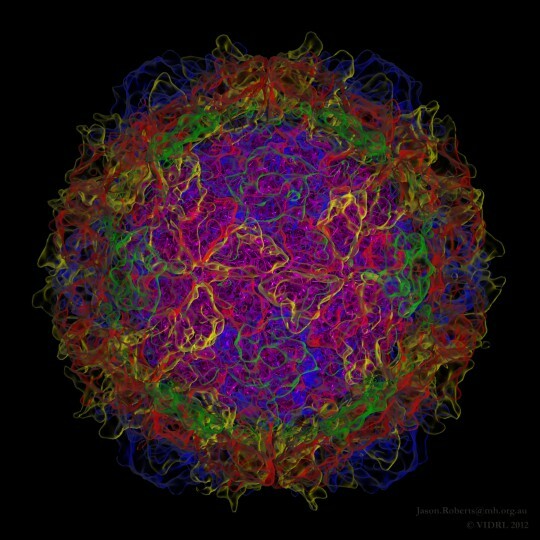 This simulation totalled 3.3 million atoms and was performed using a BlueGene/Q supercomputer at VLSCI, Image created using the Tachyon renderer in VMD. 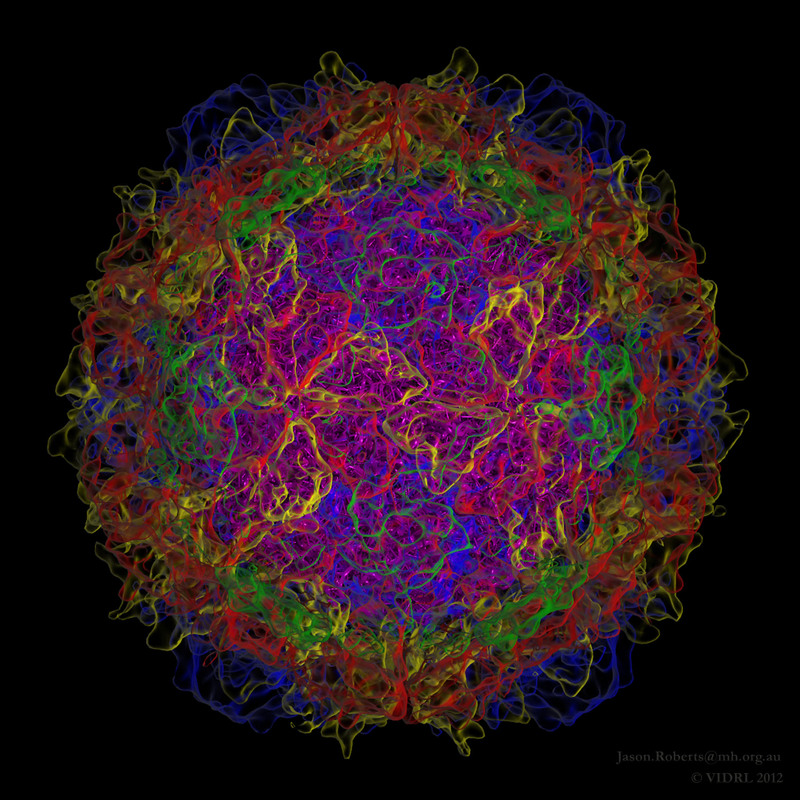 Viewpoint of the poliovirus capsid structure showing the interlocking protein chains that comprise the surrounding capsid, this representation is presented using a transparent surface to assist in the visualisation of the underlying protein and genomic structures. Protein chains are shown as Blue (VP1), Yellow (VP2), Red (VP3) and Green (VP4). This simulation totalled 3.3 million atoms and was performed using a BlueGene/Q supercomputer at VLSCI, Image created using the Tachyon renderer in VMD. Predicted prototype EV-D68 (Fermon) capsid structure using comparative protein modelling methods (SWISS-MODEL). Protein chains are shown as semi-transparent surface rendered molecule’s Grey (VP1), Yellow (VP2), Orange (VP3). Image created using the Tachyon renderer and GPU-assisted surface calculations in VMD with NVidia CUDA extensions. Predicted prototype EV-D68 (Fermon) capsid structure using comparative protein modelling methods (SWISS-MODEL). Protein chains are shown as Grey (VP1), Cyan (VP2), Magenta (VP3). Image created using the Tachyon renderer in VMD with NVidia CUDA extensions.